Find past news posts related to ASE here. 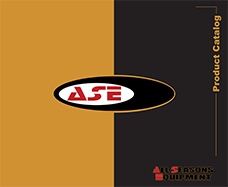 All Seasons Equipment MFG. celebrates 43 years of business. Thank you to all the dealers, vendors, and customers that love our products. After many requests, ASE would like to announce the release of our new Trash Chutes! Check the newly added "Product Page" under On-Deck/Non-powered for specs, attachments and more information. We've made some changes to our news section. To find our old news postings, click the "News Archive" button on the top navbar. Don't forget to keep up-to-date with our community via our Twitter page! As of today, we will now be showcasing our newly made ASE Catalog! Just as our previous Catalog, our new one is available to download on the left navigation bar. It is nearly finalized with some minor changes to come. Version numbering will indicate updates. If you have any feedback regarding the new ASE Catalog email us at info@asequip.com. We would like to announce the prototyping of our ASE Trash Chutes! The chutes will be used to move debris and garbage from the roof top down to the main level of the job site. If you have any questions regarding the new ASE Trash Chutes email us at info@asequip.com. As of today, All Seasons Equipment now sports a new product based on your requests! We introduce the 300 Hand Swing Hoist. A more versatile version of its original counterpart. Feel free to check out its new product page and look at the new pictures and specs. Feel free to email us at info@asequip.com if you have more questions about our new product. Today marks the release of All Seasons Equipment's new website! Feel free to criticize and scrutinize different elements of the site. If you notice something off or weird or have an idea for a feature or element that may be helpful to you, please email us as info@asequip.com. Your input and opinions are greatly appreciated. We hope that you'll enjoy the new website as much as we do.